Discussion in 'Transformers Movie Discussion' started by Ruination04, Jul 14, 2010. I keep hearing talk of Motormaster being in the 3rd movie....are there any pics of him? I have searched for them but haven't found anything yet. 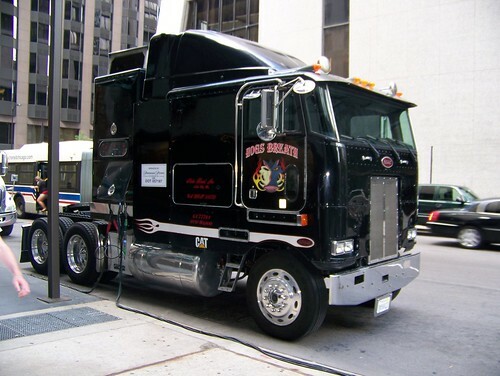 They were just pics of trucks that people thought were him, but they're actually trucks used by the production crew. so that pic of the black flat front semi was confirmed not to be him?? when i find the pic ill post it. No. That truck with 'hog's breath' on the side was an equipment truck. Prime so far is the only semi-rig in the film. If Bay was serious about the misinfo campaign, he could encourage crew members to put bot and con symbols on their vehicles. That'd be pretty cheap to do, and it would mess us right up. WOW! I can see why everyone thought MM was gonna be in! That would be awesome! Thanks for the pic!